(Nanowerk News) Future pandemics of seasonal flu, H1N1 and other drug-resistant viruses may be thwarted by a potent, immune-boosting payload that is effectively delivered to cells by gold nanorods, report scientists at the University at Buffalo and the U.S. Centers for Disease Control and Prevention. The work is published in the current issue of the Proceedings of the National Academy of Sciences. 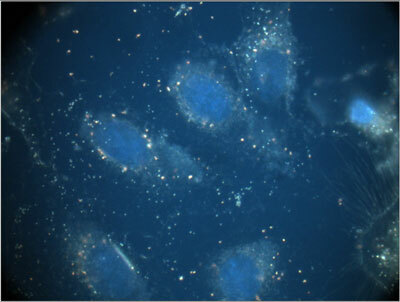 These human bronchial epithelial cells have been transfected with nanoplexes, developed by scientists at UB and CDC, that are uniformly distributed surrounding the cell nuclei. Important funding for the UB institute portion of the research was provided by the John R. Oishei Foundation, which helped pave the way for new stimulus funding UB received recently from the National Institutes of Health to further develop this strategy. The goal is to work toward an Investigational New Drug filing with the FDA.